The online travel and luggage retailer has launched the innovative Airbac backpack line with a unique air bladder design that evenly distributes weight to eliminate back pain and substantially reduce spine and shoulder damage while increasing comfort. Today Airbac is the backpack of choice for hikers, business executives, photographers, students and everyone who wants to lessen the load of carrying laptops, books, camera equipment and lots more. LuggagePoint.com, the industry-leading online retailer of luggage and travel accessories, has announced the addition of an innovative new Airbac product to their extensive selection of luggage and travel accessories. In 2005, investor Troy Christy started Airbac as a creative experiment. After observing the many back problems that were resulting from heavy backpacks, particularly among students, Christy devised a unique pack equipped with a blood pressure device to serve as an air bladder. 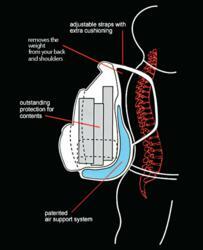 The benefits derived from a simple shift in weight distribution via this air bladder were substantial. After many revisions, Christy’s air bladder design would later grow to become the patented Airbac technology that travelers have come to adore today. Inlaid with a patented air bladder specifically designed to take the weight off the wearer’s spine and shoulders, Airbac increases comfort and significantly reduces damage to the spine. As Co-Founder of LuggagePoint.com, Sumit Bahnote explains, “Today Airbac is the backpack of choice for hikers, business executives, photographers, students and everyone who wants to lessen the load of carrying laptops, books, camera equipment and lots more.” Additionally, Airbac is the 2012 winner of Computer World’s “Best Protective Laptop Bag,” and is highly recommended by chiropractors and health professionals to patients of all age groups. LuggagePoint.com’s selection of Airbac backpacks consists of over a dozen colors, styles and textures to choose from. The company is also extending a limited time offer of free shipping on all orders of $75 or more, as well as up to 25% off select items, making LuggagePoint.com an unbeatable choice for summer travelers and well-prepared students alike. Founded in 1999, Luggage Point.com followed the genre of e-businesses and has grown to be considered as one of the number one online retailers of handbags and luggage accessories. By providing great quality products with fast, 24/7 customer services and reasonable prices, Luggage Point.com has been able to carve a niche for itself among the fierce competition in the market. To learn more about Luggage Point.com and their products, visit http://www.luggagepoint.com/ or contact their highly knowledgeable customer support team at (877) 877-7804.